[July 2008] In the peak of the Austrian summer, exploration of Salzburg’s Altstadt proved to be everything I’ve come to expect of a traditional European city – narrow streets meandering through stone archways and rows of claustrophobia-inducing buildings ready to swallow you whole. Looming above, the Hohensalzburg Castle overlooks the fabled city and the Salzach River that bisects it. Coming from suburban Sydney, where anything more than half a century qualifies as architectural old age, the place felt almost fictional. A beacon of European history and culture, best known as the home of Mozart and The Sound of Music, it seemed unlikely that the thing to most strongly spark my interest in Salzburg would be a chance encounter with an elderly compatriot. Amid the gathering evening gloom, my parents and I sought to quell our collective hunger and settled on a quaint two-storey restaurant in the middle of town for dinner. Choosing to ignore yet another parental menu dispute, I gazed out the window into the vacant Marktplatz below, silently vowing that my next European voyage would be on my own terms. I was deep in my daydream when a familiar accent dragged me back into the room. “Sounds like you lot come from the same place we do.” The unbridled antipodean twang jarred sufficiently with the setting for us to momentarily abandon any Schnitzel versus Bratwurst menu dilemmas. The source of the voice, we discovered, was the only other occupied table in the room. The diners were a middle-aged woman, Gayle (to whom the voice belonged) and her father. The customary exchange of tourist pleasantries ensued before attention returned to the respective tasks at hand; theirs to finishing their meal and ours to finally ordering something. When our food arrived, the woman and her father readied themselves to leave. We asked in passing what brought them to Salzburg. The elderly man, mostly silent until then, cleared his throat and introduced himself as Bill Pearce. And the reason he’d flown to Austria was to meet the man who tried to kill him six decades earlier. We sit in Bill’s modest living room across from each other, a mere ten miles away from his childhood home of Carina, yet several thousand from where our first meeting took place in Austria. The eldest of eight children, son of a WWI ‘digger’, William George Pearce speaks fondly, if not a little vaguely, about his childhood in Brisbane. He was only 16 when the war broke out in 1939 but with conscription in place and no sign of the conflict ending, by 1941 he decided to enlist. This decision stirred up strong protests from his father who, having experienced the horror of trench warfare himself, held the strong view that “if he could prevent it, no son of his would ever have to go through it”. Pearce, whose friends were joining the army in great numbers, countered with the argument that sooner or later he would be involved and reasoned that he would prefer to go as a volunteer rather than a conscript. He assures me there were no thoughts of patriotism or any sort of heroics involved in making his decision. Finally, his father arrived at a compromise – that he could join the air force. This came attached with the ulterior motivated assumption that if anything happened in the air it would probably be over and done with quickly. The great irony, I soon learn, is that what Pearce endured between February and May 1945 was anything but quick and painless. As we talk, his restless fingers look to busy themselves but settle for fidgeting on the arm of the sofa. They don’t have long to wait, however, before they spring into action again, prompted this time by a friendly greeting from the back porch signalling the arrival of his daily meal. The delivery is made by two young women whom Pearce jokingly warns not to interrupt our important business before introducing me. He boasts about being my interview subject, blowing on his fingernails and polishing them exaggeratedly on his shirtfront for effect. I watch in genuine amusement to see him break from his relentless humility and pragmatism for the first time. “They make my day,” he says with utmost sincerity. We speak of everything from cricket and the recent Ashes series, to music and his penchant for what he dubs his collection of ‘hillbilly records’. But Pearce’s involvement in WWII remains the focal point of our conversation. 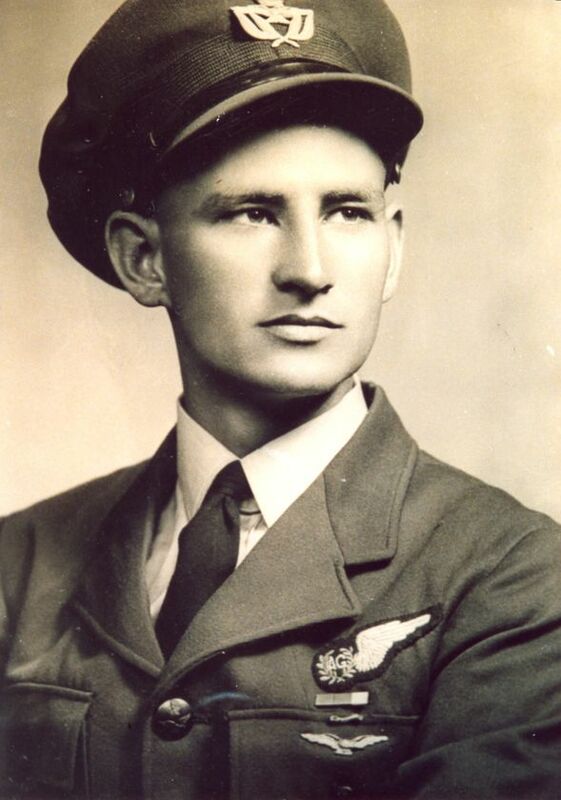 The facts are these: Pearce enlisted in the Royal Australian Air Force on May 21, 1942. He was selected as a Wireless Operator/Air Gunner (despite listing his first preference for the role of pilot) in January 1943. Following further training he was shipped off to England via the United States in what could be conservatively described as the scenic route. Countless boats, trains and continents later, he arrived at his destination of Brighton on October 15, 1943 (having not yet arrived at his 21st birthday). The next year or so was spent in service on missions, or ‘ops’, and wiling away the hours in between. 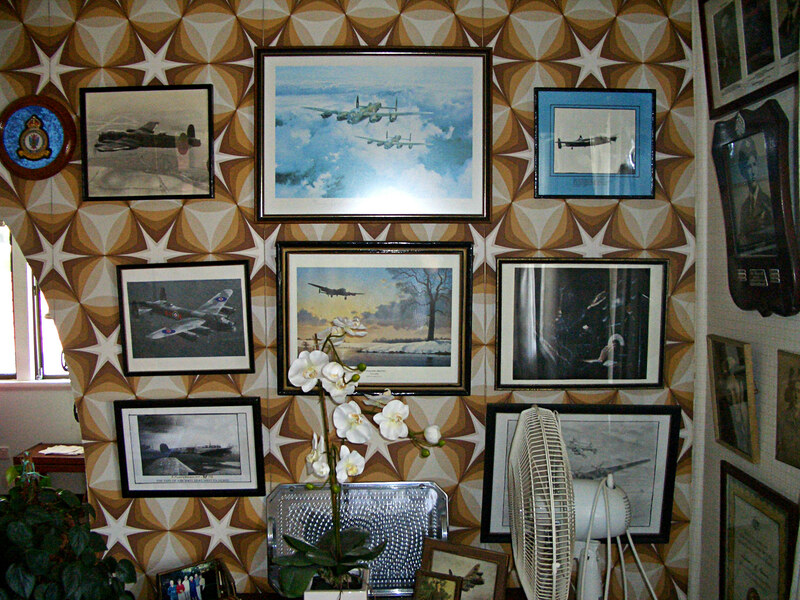 Not being particularly war-savvy (with the exception of my ability to expertly mimic the staccato of machine gun fire during childhood games), I ask about the sensation of flying in the Lancaster. Bill remembers the moment his plane was hit with “a loud, rendering, explosive whoomp”. 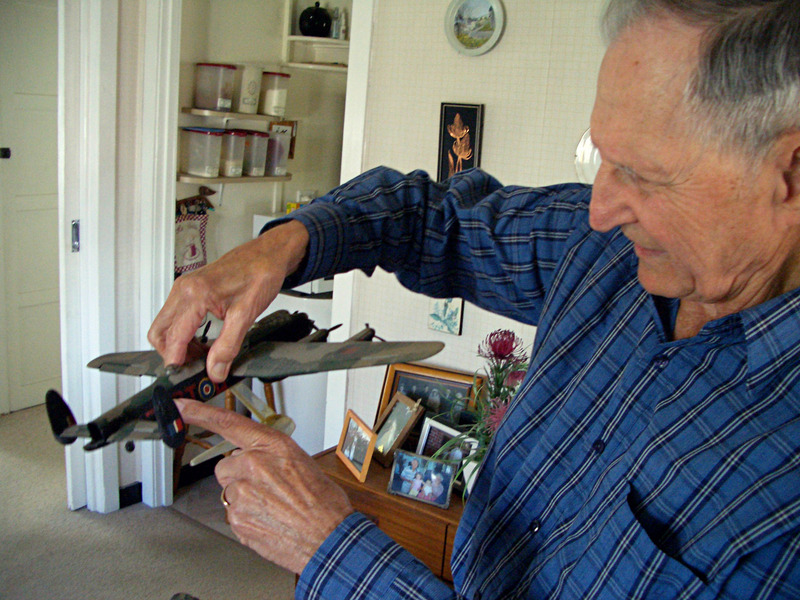 Using small models of his Lancaster and the Messerschmitt Bf-110 he eagerly points out the point of impact on the rear turret and starboard inner engine. Despite going cold all over and his stomach dropping to his boots, his calmness under pressure allowed him to follow procedure and exit the aircraft in one piece, though he credits the lack of oxygen (of course he had to remove his mask) for most of his composure. After ‘bailing out’ of the flaming Lancaster, he experienced a terrifying plunge through the darkness with invisible aircraft roaring all around him. Not being able to see the ground as he approached, he severely injured his left shoulder on impact – an injury which still troubles him today. “I knew there was no welcoming committee waiting for me on the ground,” he says of falling through the night sky. He then engaged in a new battle as he wandered through enemy territory in southern Germany for five disorienting days, armed with nothing more than a small survival pack and a vague idea to head west. But having survived the aerial assault, unlike three of his crew members, his resolve was even greater not to perish on the ground. He was eventually discovered sleeping in a field by an elderly German man whose brisk command (“Komm!”) left a weakened Pearce with little choice but to follow. From here he was handed over to the Luftwaffe and subsequently taken to a POW camp for the remaining months of the war. Amazingly enough, being shot down in the middle of the night and narrowly escaping a damaged plane doesn’t rank as Pearce’s most frightening moment. Rather, it occurred as the Allied prisoners continued their supervised march out of the Stalag 13D camp where Pearce had been held. As the Allied forces began to gain the upper hand in the conflict, Hitler ordered that no prisoner should fall into the hands of the enemy. Prisoners were therefore moved away from the war zones until there was nowhere left to go. 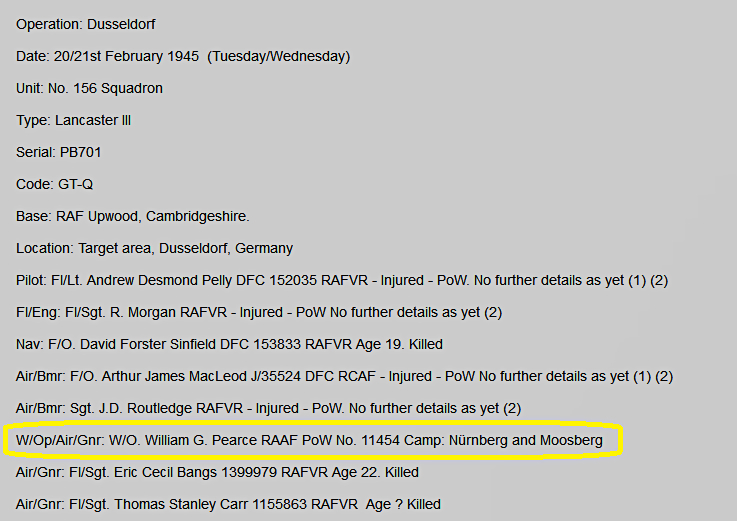 According to Pearce, most of these POWs ended up in Bavaria. But it was during one such relocation on April 3rd 1945 that he really feared for his life. The prisoners walked along the road in three columns when four American Thunderbolt fighter planes appeared above. Presumably mistaking them for German troops, the planes peeled off, dived, and sprayed machine gun fire at the marching group. While bullets tore through the front of the pack, Pearce, nearer the middle, was able to scramble off the road and dive behind a nearby tree. Another man aimed for the same tree and landed on top of him. MISS. M.BALL, 16 ARCHIBALD ST., GLOUCESTER. Understandably, having not heard any word for almost three months other than the fact he was missing after his Lancaster failed to return, this telegram caused quite a stir amongst Pearce’s loved ones. But the relief undoubtedly outweighed the annoyance. His relatively safe return could be attributed to many things: an equal dose of skill and luck; an immense amount of determination; or unyielding common sense. It might have even been the small souvenir boomerang his mother gave him before he first left Brisbane, attached with sentiment that boomerangs always come back. Either side of the war he worked for meat company KR Darling Downs (the only other job he ever held), right up until he retired as manager in 1982. Bill Pearce and Marjorie Ball were married in Gloucester on June 30, 1945. They remained together up until 2006 when Marjorie passed away from kidney failure after an ongoing battle with ill-health. 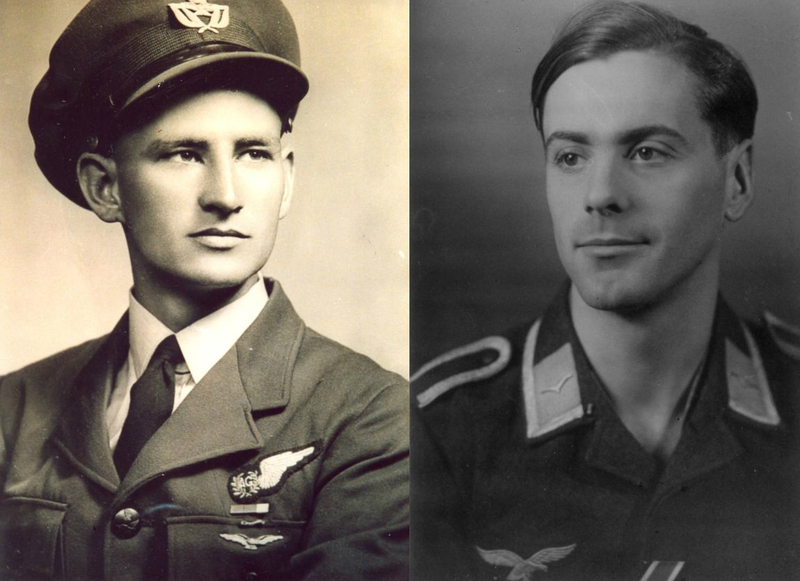 In 1999, whilst writing his memoirs, Pearce was given the contact details of Austrian man, Walter Telsnig – one of three crew members onboard the Messerschmitt that had shot him down 54 years earlier. Having made the initial decision to write to Walter without hesitation, nine years of amiable correspondence followed. The opportunity then arose for the two men to meet in person and this, of course, was the principle reason Pearce and his daughter had ventured to Austria where we had first met in the restaurant. It was the first time they had met face to face since their perilous encounter 63 years earlier when Telsnig had, for all intents and purposes, tried to kill him. Not at any stage, however, has Pearce held any kind of personal grudge. “At the time it was war and he was doing what he was supposed to be doing – and was trained to do – and so was I.” Both men managed to keep a sense of humour about the circumstances, with Pearce mounting a framed tribute on his wall depicting the two of them as ‘The Victor’ (Telsnig) and ‘The Vanquished’ (Pearce). For all his nostalgia and obvious enthusiasm in recounting his story, Pearce makes no secret of the horror of the war. Speaking of his time in the air force, Pearce says, “I couldn’t get out of there quick enough.” But he concedes that it was an experience he values greatly and one which, though brief, has certainly defined his existence. We chat a while longer over lunch and I get the extended tour of the Pearce residence, complete with war memorabilia and old cricket team photos. Dutiful as ever, Pearce explains the need to document his experiences – saying he was part of an entire generation who believed their stories shouldn’t die with them. On a personal note, for all that fate has conspired for me to narrowly miss out on, I’m glad to have had the good fortune of meeting Bill and the chance to share his story. 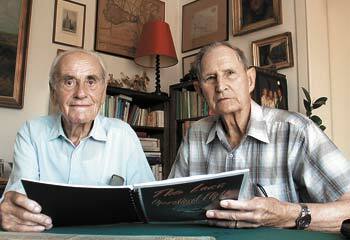 Bill Pearce died in April 2012 in Brisbane aged 89, just five months after the death of his good friend Walter Telsnig in Austria.